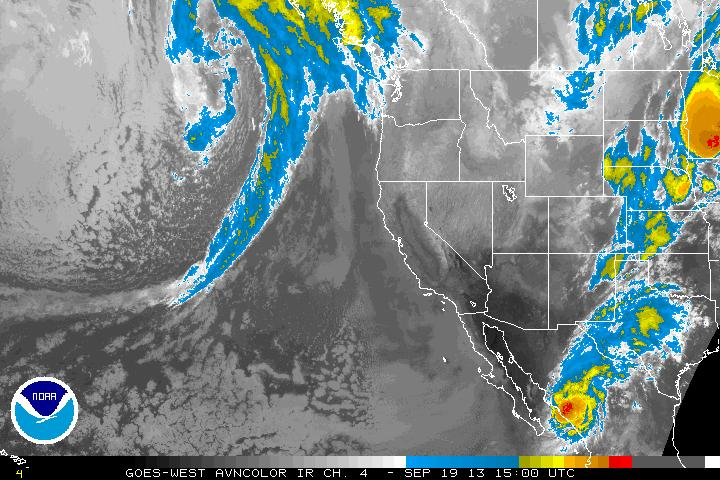 Nervously Watching Hurricane Manuel Moving Northward. 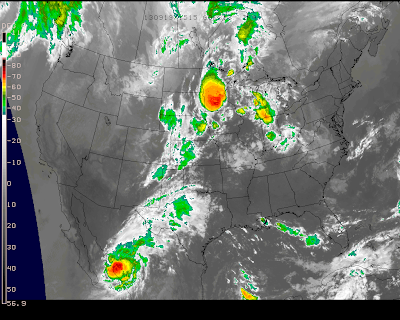 IR Satellite Image At 9:00 AM MDT. 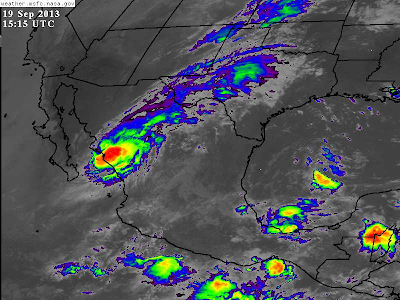 IR Satellite Image Of Hurricane Manuel At 9:15 AM MDT. 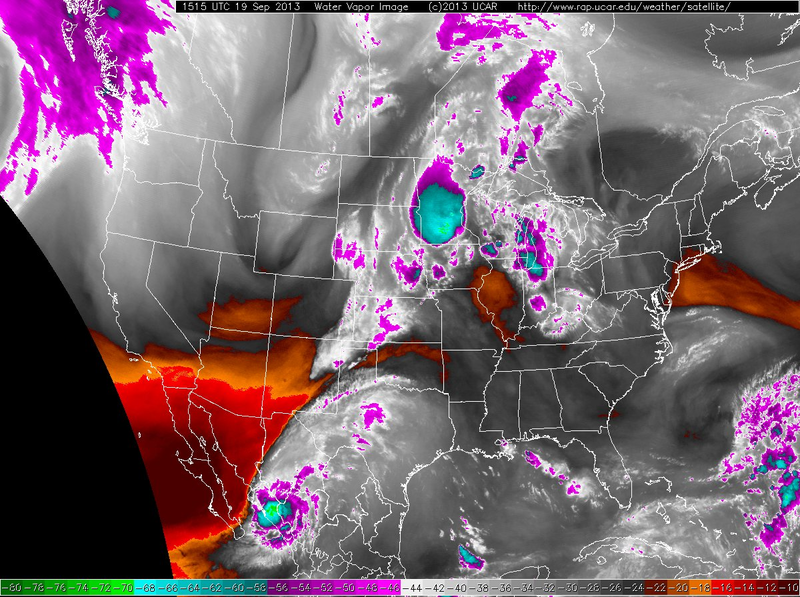 Water Vapor Satellite Image At 9:15 AM MDT. 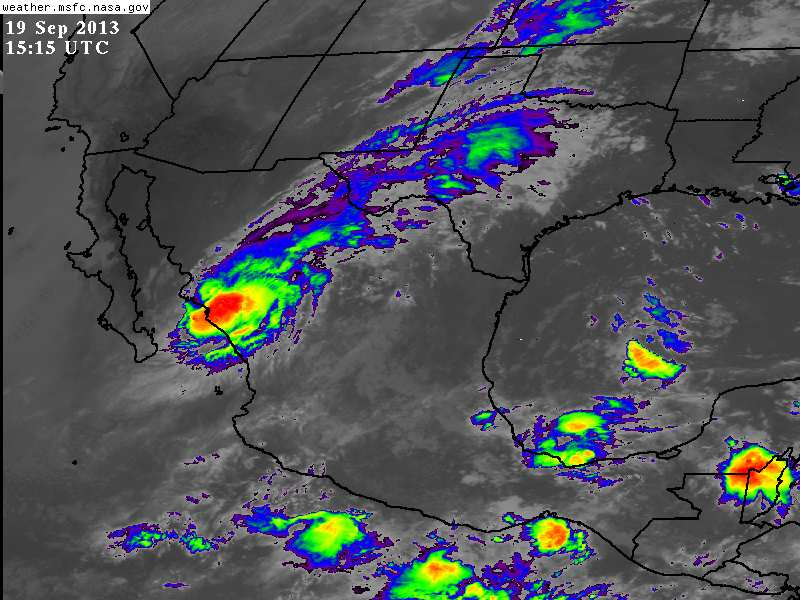 Hurricane Manuel Moving Inland and Dissipating This Morning. Total Rainfall Forecast Valid At 6 PM MDT This Evening. 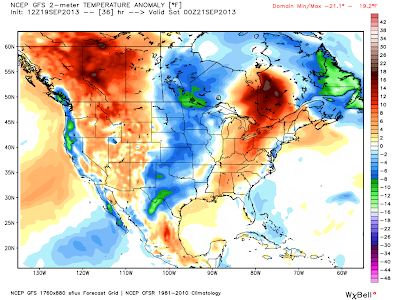 This Mornings 12Z GFS Temperature Anomaly Forecast. Valid At 6 PM MDT Friday, Sept 20, 2013. Hurricanes are one of the most difficult meteorological phenomena that there is to predict. 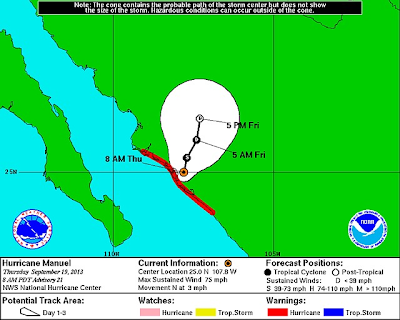 Currently Hurricane Manuel is moving inland and breaking up northward near the Baja Peninsula. This Hurricane is proving to one of those more difficult cyclones to predict when it comes to the computer forecast models. I am noticing a subtle shift in its forecast track by the NHC further to the west and north than has been predicted the past couple of days. Should this trend continue today into tomorrow this potentially could be some bad news for us here in southeastern New Mexico. What we do not need right now is more heavy rains that may produce additional flash flooding from this dying Hurricane! The models are having a difficult time in trying to resolve just exactly where Manuel's remnant moisture is going to go. As of 10:00 AM MDT the Midland National Weather Service Forecast Office is continuing its Flash Flood Watch for much of west Texas. At this time they are not including Eddy, Lea and Culberson Counties. 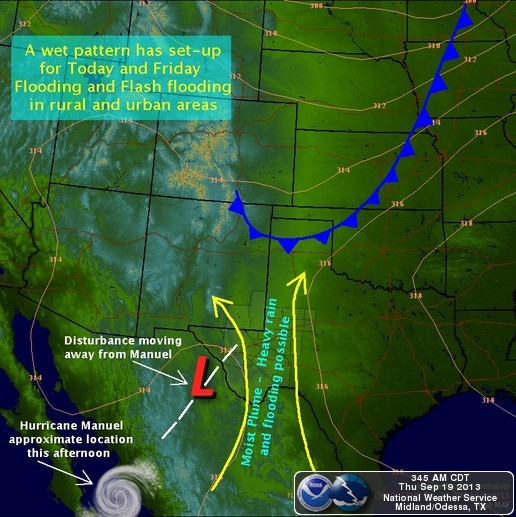 Should the remnant tropical moisture from the dying Hurricane Manuel track further to the west and north than is currently being forecast by the models, and ends up in southeastern New Mexico, then we very well may be facing another Flash Flood threat later today into Friday. This situation could also be potentially be further aggravated by an approaching cold front from the north due to arrive in the local area tomorrow.